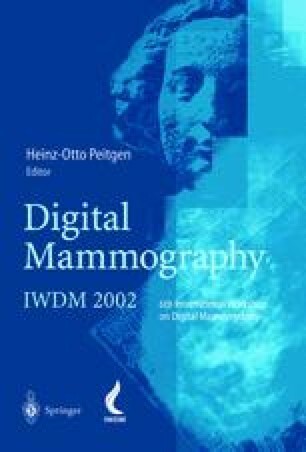 An experimental and modelling study is being made of the influence of tube voltage, target material and exposure on the performance of digital mammography systems. Digital images of the ACR accreditation phantom at 80 mAs, 25–32 kV and at 28 kV, 5–500 mAs were read by eight observers, and the numbers of fibres, specks and masses visible determined. The computer model simulates photon transport through phantom, anti-scatter grid and image receptor. It calculates image pixels and the signal-to-noise ratio per pixel (SNR) for the phantom details. For exposures below 100 mAs, the numbers of fibres and masses visualised were found to be consistent with a constant SNR threshold for detection. For the visualisation of specks, the product of SNR and speck area was approximately constant. At higher mAs, the number of objects visualised was little influenced by exposure, due to the limited dynamic range of the phantom. The results validate the use of computational models to predict performance for simple detection tasks against a uniform background.